There are times when things go awry and situations arise which may not be to our advantage. We may not have the power to control our external reality, but we definitely have the power to control our inner reality and to mould it in ways we wish it to be molded. Meditation is one of those relaxation techniques by which we study our mind and by repeated training, transform it for the better. By concentrating on our inward nature, we gain heightened consciousness of things happening within us and around us. This enables us to strike a better balance between the body and mind. Mediation, by making us aware of the changes enables us to be stay more focused, calm and in control of the situation. The aim in meditation is to decrease the negative mindset and develop a more positive and holistic approach towards life. There are many ways by which one can practice meditation. Some of them are enumerated below. This is probably the base for all other types of mediation as every form of meditation that we tend to practice has one basic core point which is concentration. Single minded concentration on an object helps us to focus more and better realize our goals. A single pointed beam of light is far more effective than rays of scattered light. Similar is the case with the mind. When our mind runs in various directions, we are not able to give our best shot. But when we channelize our thought process in one direction, we are able to perform better. The idea is to simply focus on something; it could be a mantra, a thought or an object. Initially, you might find your mind wandering and deviating from the said object but with training you will be able to better regulate your thoughts and channelize your mind in the direction you want. Mindfulness meditation or Vipasana is one of the more popular form of meditation practiced in the west. Vipasana believes in letting your mind dwell on thoughts while at the same time remaining detached from it. Through vipasana, one is made aware of one’s breath and concentrate on it, yet no effort is made to regulate it. At the same time, the mind is allowed to dwell on numerous thoughts that crisscross through it. No attempt is made to block them. By concentrating on the breath, the practitioner focuses on the present moment with no regard for the past, that is gone or the future which is unknown and uncertain. One is enjoined upon to devote their attention to the present moment. Regular practice of vipasana enables a person to observe one’s thoughts in an objective manner and realize the impermanence of all things. This form of meditation practice which originated in India requires you to repeat a mantra and concentrate on your inner being. In TM you can control and modulate your breath according to your mental state. Here the aim is neither concentration nor contemplation; rather it’s an approach where you attain a state of restful alertness or transcendental consciousness. TM is one of the simplest examples of mantra meditation where the user is asked to focus on a particular mantra. The meditator is asked to be in an acquiescent state and if at all the mind wanders, it is again brought back to focus by concentering on the mantra. Even a 20 minute session of TM can prove extremely beneficial to the person practicing it. 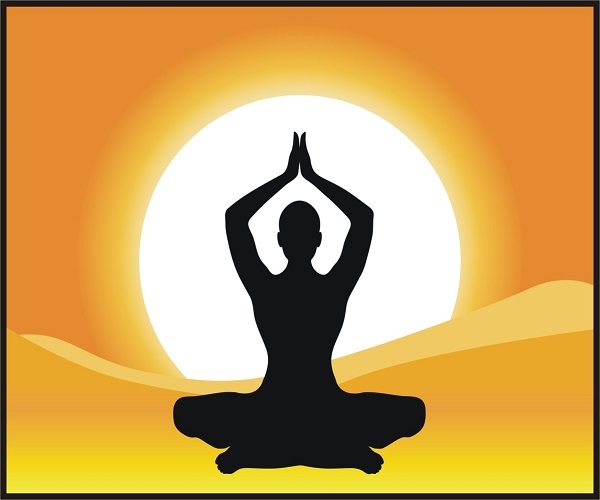 This is a form of meditation where the aim of the exercise is to root the spirit in the heart. Here you don’t escape from life, rather you get to experience your life as it is. The aim of this form of meditation is to help you focus on your heartbeat and gain insight into the compassionate part of you. HRM is a good way for a person to realize his latent energy, discover his hidden talents and understand the purpose for which he was created. 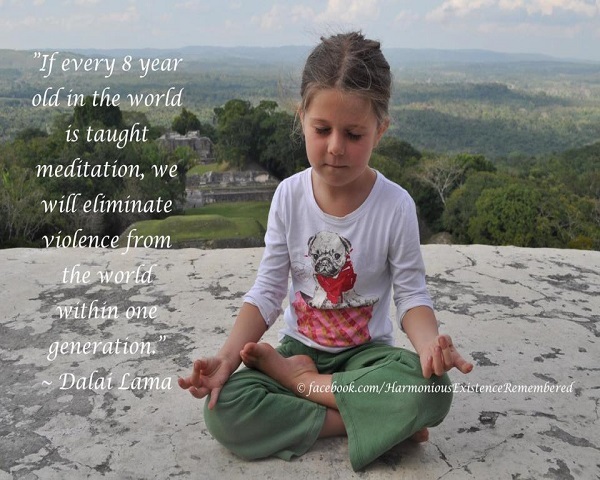 This is probably the most important reason why people meditate. Stress is an unavoidable part of our existence leading to a lot of emotional and physical disquiet in our lives. Meditation helps calm a person and makes them face stress and difficulties head on without having to succumb to panic attacks. When we meditate, our stressful thoughts gradually disappear paving the way for more positive and happier thoughts. Meditation not only helps us to relax but it also enables us to get a clearer picture as to why we get stress in the first place. The person begins to identify the unhealthy patterns of thought that lead to stress. Meditation also helps a person to develop positive thoughts such as positive energy, patience, calmness which help drive stress away. It is seen that people who meditate have increased activity in the left frontal lobe which is generally more active in happy and optimistic people. People who mediate regularly recover quickly from anxiety and stress related situations. Stress is one of the leading causes of hypertension or increased blood pressure in individuals. You control stress and you control your blood pressure. Mediation is very effective in helping a person de-stress, thus a good cure for high blood pressure. When a person meditates, they enter a deep state of relaxation where one stops worrying about unnecessary stuff, the fluff of our lives which can be easily discarded and thrown away. 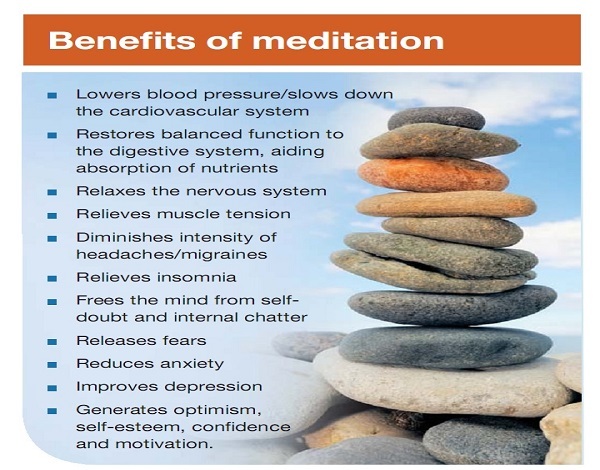 By cutting away at stress causing factors meditation helps us to strike a deft blow at hypertension. How often has it happened that we have a pressing matter at hand and our mind begins to wander in unnecessary directions. Studies show that the wanderings of our mind are related to our brains default mode network, that region of our brain which is associated with creativity and with our run-away thoughts. It is however, possible to control the mind by practicing meditation. In mediation, you focus on a particular syllable, or a specific object. Doing this reduces your chances of straying. People who undergo regular meditation are able to better control their default mode networks. Research proves that meditators are able to establish better control over this network while they are mediating and also when not meditating. Meditation considerably increases our concentration powers and also improves our mental discipline. We are so caught up in our past actions that we rarely think of our present. Meditation helps us to concentrate on the present moment which we rarely do. Constantly ruminating on the past, on what could have been leads to production of negative energy in the body. Honestly, we achieve little out of it. Whatever has happened has happened. No power on earth can change that. If we wish to stay healthy, it is imperative that we let go of this stagnant energy and allow fresh energy to circulate within. 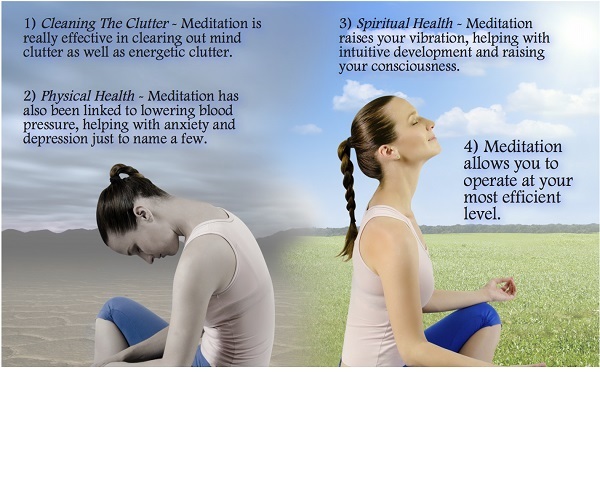 Regular meditation helps one to better establish control over their emotional thought process. By meditation you can analyze your thoughts objectively and allow the negative energy to flow out of the body, thereby healing your body and mind. It is seen that meditation leads to increased electrical activity in the hippocampus and prefrontal cortex region of the brain. These regions are linked to our immune system. When they are adequately stimulated they enable the immune system to function more efficiently. A study also shows that people who mediated had increased levels of antibodies in their blood which strengthen the body’s immune system by fighting against foreign agents. Meditation not only provides physical benefits to the practitioner, it also offers immense spiritual benefits to a dedicated follower. When one meditates, one connects with their true inner self, not our ego ridden self which is a bit selfish in nature. Meditation helps us get rid of our false ego and shows us that we and our fellow creatures are all part of that one Creator. 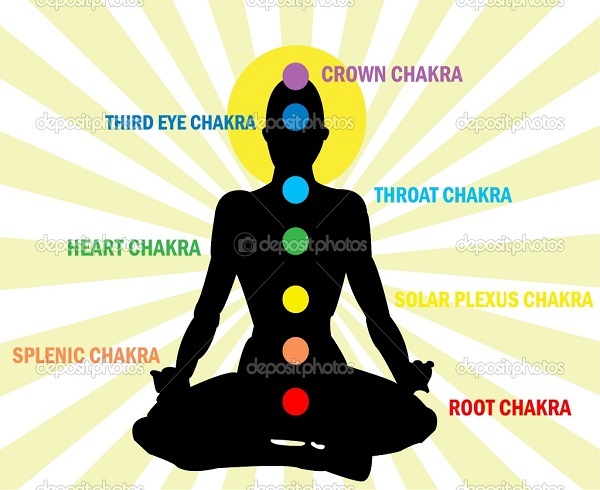 It thus not only helps us to connect with our inner self but also with our fellow beings. It allows us to tap into the unbounded reservoirs of magnanimity hidden within us which makes it possible for us to feel uninhibited feeling of compassion and benevolence towards others. Regular meditation helps a person become more aware of their self and their real feelings. As one becomes more percipient of their real nature, it becomes easier for them to make better choices in life. The hurly-burly of our existence has put a veil on our latent energy and spirit, hiding our real nature both from the world as well as from our self. Meditation helps us to clear the fog, remove the veil and peep into the limitless unbounded reserves of energy hidden within us.